Mix the purple of the heather with the green of the forest and you have the color of the landscape in the Kempen. Sunparks Kempense Meren lays in the middle of it, at one of the largest lakes in Vlaanderen. The park offers enough space and is the ideal location for your meeting or event, provided with catered meals and a pleasant stay. Whether you come as a couple or bring 1,000 guests, no problem. You can even rent the entire park! Sunparks Kempense Meren offers a wide range of accommodations, namely the Select and Exclusive holiday houses and a 3-star hotel. Furthermore, the park has a meeting center with 6 meeting rooms and numerous sporting activities for young and old. With a particularly wide range of possibilities, Sunparks Kempense Meren always offers the best solution for you. The park offers the possibility to stay for small groups of 10 people and large groups up to 1000 guests. Sunparks Kempense Meren has a full meeting center with 6 meeting rooms for conferences up to 1,000 people! The rooms are equipped with flip chart, pen and paper, water and additional audio-visual equipment if desired. The rooms can be lined up in several ways, for example Theatre style, U-style, Conference Style, Executive Style, School Style, Banquet Style or Reception style. 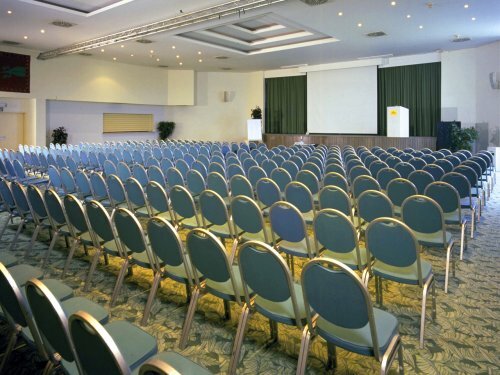 We can help you with the layout of the rooms, taking into account the type of meeting and the number of guests. In addition, all technical devices are available to ensure your meeting runs smoothly. Besides our meeting facilities, we also take care of your catering in the form of a buffet, a reception or banquet. Whatever you organize, Sunparks offers you a customized solution with the required facilities, delicious meals and an ideal accommodation for everyone. Of course we would like to discuss a customized program with you. Besides organizing parties, conferences, exhibitions, product presentations, group stays, family celebrations, weddings, corporate event and team building and training, Sunparks also offers you the opportunity to exclusively hire the entire park! At Sunparks Kempense Meren you have the choice to stay overnight in our full-service hotel or the comfort of our holiday houses. The star hotel has 48 rooms and 2 suites. Each room has a private bathroom with bathtub, shower and separate toilet. The rooms have TV and telephone. Our cottages are fully furnished holiday houses with a dining and living room with TV and fireplace, a fully equipped kitchen, separate bedroom and a bathroom, separate toilet and a terrace. The accommodations are equipped with all the comforts of home and can accommodate up to 10 people. Our exclusive holiday houses are luxurious holiday houses with extras such as a dishwasher and an infrared sauna. At Sunparks it is always summer, all year round! Good weather or not? At Sunparks the sun shines all year round. The subtropical water paradise Aquafun is always a pleasant 28 ° C. In addition, kids can enjoy themselves immensely in the Kids World, an indoor playground. Furthermore, Sunparks offers more indoor activities such as; badminton, bowling, pool, sauna and squash. Of course there is also the possibility of outdoor activities, namely; beach volleyball, miniature golf, Nature walks and cycling. Coming from Ostend, you take the E34 Antwerp / Turnhout / Eindhoven. Take exit 26 Arendonk / Mol / Retie. You follow the direction Mol / Retie / Molse Meren. Before reaching the center of Retie, you turn to the left, direction Postel. From there you follow the signs Molse Meren and the Sunparks signs. Coming from Calais, you take the E40 Belgium (Belgique). When you arrive in Dunkerque, you follow the direction Furnes (Veurne). Then you take the E34 Antwerp / Turnhout / Eindhoven. Take exit 26 Arendonk / Mol / Retie and follow direction Mol / Retie / Molse Meren. Before reaching the center of Retie, you turn to the left, direction Postel. From there you follow the signs "Molse Meren" and the Sunparks signs.